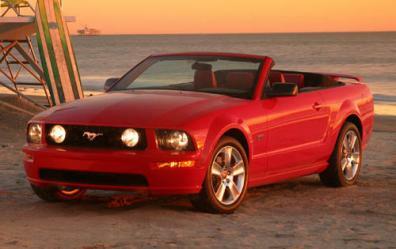 "2006 Ford Mustang: Retro Cruiser"
The all new 2006 Ford Mustang Review. When Ford decided to redesign the Mustang, they opted to incorporate a retro look, much like what was done previously with the Thunderbird. Fortunately, Ford didn�t look at the ghastly Ford Mustang II series from the 1970s for a template, instead the US automaker drew upon the second generation Ford Mustangs of the late 1960s for their inspiration. Let�s just say that the redesigned Ford Mustang has been nothing short of a sell out hit. Introduced as a 2005 model, the retro Ford Mustang for 2006 offers only one change: the introduction of a Pony package which is meant to give the car a GT look and feel. Borrowing from the fastback design of the late 1960s, the 2005 model was such a hit that Ford could not keep up with production. Buyers have a choice between a 4.0L V6 and a 4.6L V8 engine to power the Mustang. With 2+2 seating, 107 inch wheelbase, and a curb weight of just under 3500 pounds, the car cruises down the highway with 210 and 300 horses respectively. Each engine is mated with a 5 speed manual transmission and a 5 speed automatic transmission is optional for both. 4 wheel disc brakes and optional traction control [standard with the V8] help keep the Mustang under control. Clothe bucket seats are standard with leather seats optional. All models come with tilt steering wheel, cruise control, power locks and windows, power side mirrors, and air conditioning. Ford gives buyers a choice between 5 coupe and 5 convertible models with base MSRP starting at $19,810 for the coupe and $24,635 for the convertible. First year sales of the Ford Mustang were so good that the car sold out by early Spring. In fact, the Ford Mustang dethroned the Chrysler 300 as the hottest car on the market with more than 15,000 Mustangs sold per month. All of this production is from just one factory. Production for 2006 is certain to be tight and with little incentives available � they certainly aren�t needed � the Mustang is likely to continue to have a long waiting list of customers desiring the sporty coupe. Considering that sales across the Ford division are flat, this is good news for an automaker desperately needing a hot seller.